There is hope and without it, nothing really matters. No matter where you are, or what has happened before, each moment is a new beginning. I truly believe, in my heart of hearts, the hope of humanity is to unite together and create a world that is free of strife and hunger and born of love and joy. 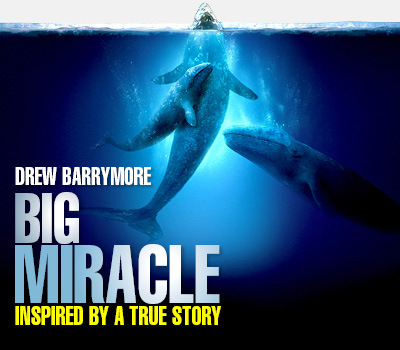 My experience creating this Big Miracle article is filled with joyful tears as I realize we stand at a true turning point in history. Although we see collapse around us, it is the hope for a new tomorrow that binds us. 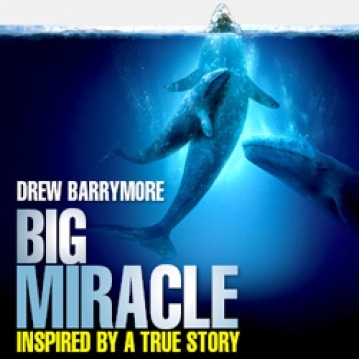 Inspired by the true story that captured the hearts of people across the world in 1988, the rescue adventure movie, Big Miracle, tells the amazing tale of a small town news reporter, Adam (John Krasinski) and a Greenpeace volunteer, Rachel (Drew Barrymore), who are joined by rival world superpowers to save a family of majestic gray whales trapped by rapidly forming ice in the Arctic Circle. Local newsman Adam Carlson can’t wait to escape the northern tip of Alaska for a bigger market. But just when the story of his career breaks, the world comes chasing it, too. With an oil tycoon, heads of state and hungry journalists descending upon the frigid outpost and time running out, Rachel and Adam must rally an unlikely coalition of Inuit natives, oil companies and Russian and American military to set aside their differences and free the whales. The incident created a temporary Cold War thaw as President Ronald Reagan and Soviet leader Mikhail Gorbachev found a common cause to work together at the top of the world. Three resounding messages come to life in this film, scheduled for release on February 3, 2012. Within everyone there is hope; within everyone there is courage; and within everyone there is power: Hope. Courage. Power. This month’s feature celebrity is YOU and ME. It’s all about us; who we are, what we hope for… and the courage it takes to inspire our inner resolve and tap into the power that is inherent within. “Knowledge is power.” Francis Bacon, “Perhaps those who are best suited to power are those who have never sought it. Those who ... have leadership thrust upon them, and take up the mantle because they must, and find to their own surprise that they wear it well.” J. K. ROWLING, Harry Potter and the Deathly Hallow May your year be filled with love and joy --- in each and every moment.